Given the multiverse of IPA variants to have appeared in recent years, you'd think there would be little left uncharted. Heck, Two Birds even released a glitter IPA in tribute to David Bowie earlier in the year. 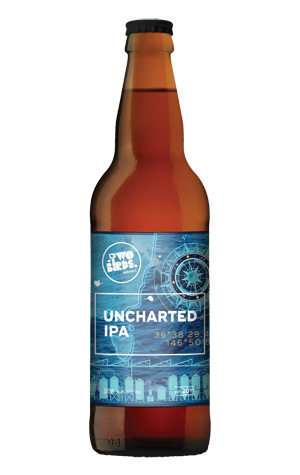 Still, for the latest IPA in an IPA-heavy year for the Spotswood brewery, Uncharted it is. That said, we're not into a new IPA category here; it's a case of playing around with new ingredients. On the hop front, that means utilising one of Hop Products Australia's experimental varieties, currently going by the HPA-016 tag. And the malt comes courtesy of a single farm in Ungarie, New South Wales, part of the Joe White Signature range. There are risks when playing with new ingredients and, indeed, when playing with just a single hop variety rather than putting together a blend to achieve your goal, so how has the Two Birds navigation crew fared? Far from running aground, they've delivered what could well be the most enjoyable of all the IPAs to have left their Nest this year. Very pale with a mild haze, it's got citrus peel characters to the fore, complete with a pithy, piney bitterness. The label goes with mandarin; equally, you might pick up grapefruit, even a touch of lemon and something herbal amid the hop flavours. Given the outcome here, reminiscent of a lean West Coast IPA, you'd think 016 will soon join the likes of Galaxy, Enigma and Ella in the permanent HPA family.